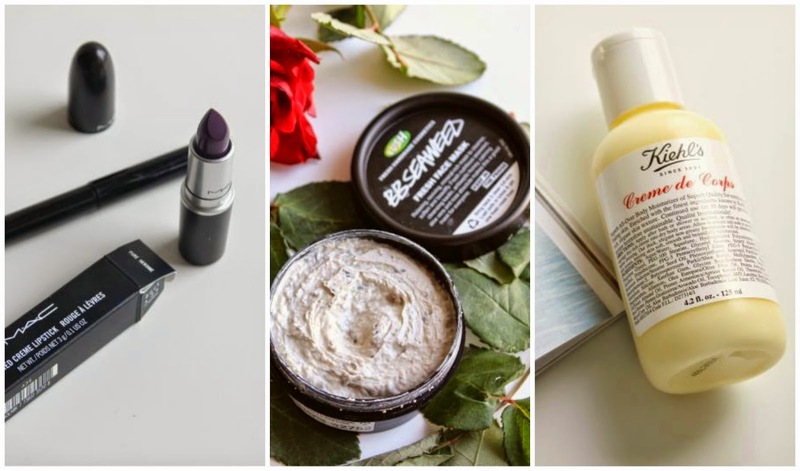 Did you know that a few brands have recycling policies which can result in you receiving free products? No? Well Kiehl's, MAC and Lush all offer great freebies should you collect empty pots and return them in store. Of course there is more to it than that so let me outline the terms and conditions for each brand and what you can expect for free. This is of course the Back to MAC programme which in the UK will result in a brand new lipstick (the standard lipstick line not the Mineralize and sheen supreme collections). To get your mitts on a free lipstick you need to return six empty but complete full sized products (they can be limited edition products). By complete products I simply mean that some stores will not accept de-potted eyeshadow pots should they be missing the silver pan inside. Fancy a free face mask? Well all you need to do is take back five clean black pots, they must be full size for example any face mask pot, the moisturiser pots, body lotion pots and although not black the clear tubs the shower jellies come in count too. Any product within Lush's recycling programme do come marked with a label which states the above information which makes it a lot easier to know what counts and what doesn't. By returning three empty and full sized Kiehl's products, you can receive a lip balm. Return five, and you can get a free travel size product (2.5 oz.). Should you return 10 empty product bottles, you can get a free full-size product, plus the lip balm and travel size product. Pretty generous huh? Well worth holding on to and collecting those empties from here on out! Oooh I didn't know MAC had a programme like that defintely gonna save my empties. I've trying to empty my products pronto - would love a free lippy! I knew about Lush, but I did not know about MAC and Kiehl's, this is good to know, thanks! Thank you for this post. So helpful. I am so sharing this post with my friends, I had no idea, and I doubt they do too. Thanks for letting us know - no more chucking empties from m. This is so handy to know. Also read on Benefit's instagram that if you bring them an eyeliner (any it seems) they will swap you for a mini "they're real" eyeliner at boots chemists. I love Mac's 'Back to Mac' programme, definitely great to get extra product. I have been doing back to mac for quite a few times now after i depot my eyeshadows :) Its just so great and I love always having a nice new free lipstick. Thanks for this, I knew about the Back to MAC but not the other ones. Never knew about the Lush programme, thank you! Oh god I had no clue! I've definitely cashed in on a free face mask or two from Lush. Did not know about the others, though! If you're a huge mac buyer the back to mac program is amazing! I have a little collection of empties going at the moment waiting for me to reach 6. I didn't know about Back to Mac program. Thanks for sharing. I knew that MAC did this but not the other brands! Will be saving up my empties more in the future! I knew about Mac and Lush, but I'd never heard about Khiels before! Will keep it in mind!